An Enzyme taht speeds up a certainbiochemical reaction which is needed to improve the function of the various body systems. Reduces the recovery time and pain early in the healing phase. Exhibits antioxidant activity as well as anti-inflammatory & anthihistaminic properties. Increases the strength of the walls of the blood capillaries. Bromeline as a supplement,used to ease pain & swelling and reduce inflammation. Exhibits anti-inflammatory action as a result of inhibiting the generation of bradykinin at the inflammatory site via depletion of the plasma karllikrein system. 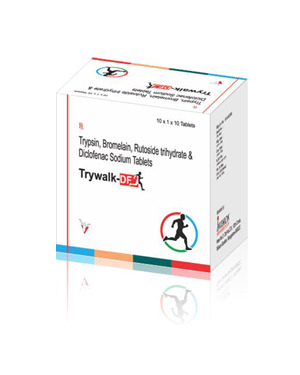 Reduces pain and improve knee function in arthritis when combined with trypsin & rutoside. A time tested potent anti-inflammatory agent with excellent analgesic activity.